July 29 at 4:00 a.m., my five-foot-one and barely-north-of-100-pound frame was patiently waiting in the shadow of a literal castle to embark on my first 100-mile adventure. Thoughts of “What will happen?” and “Can I even do it?” swirled through my mind, subtly scraping away at what little confidence I had remembered to pack. As a medical resident, staying awake and alert for 24 hours or more was nothing new to me, but running for that long? Now that was unfathomable. With my race eve Chipotle processed and evacuated and my race morning coffee tank topped off, I equipped my hydration pack with the best nutrition known to mankind (bunny-shaped fruit snacks, jellybeans, and pouches of chocolate hazelnut butter, of course) and collected final hugs from my crew. I greatly appreciated that they were voluntarily geeking out in neon orange crew shirts that I purchased for them along with practically every other piece of race logo merchandise available for sale at packet pickup. What’s running 100 miles if you can’t have a lifetime’s worth of logo-ed clothes, coffee mugs, and more? 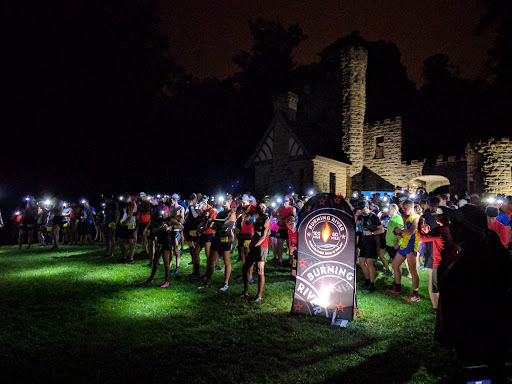 A few more minutes and a beautifully-sung national anthem later, a sea of a 100-mile, 50-mile, and relay-running headlamps initiated their descent of northeast Ohio from Cleveland to Akron as part of the Burning River Endurance Runs and Relay. The first 11 miles were dark and quiet, mostly road, and fortunately grossly uneventful. I shuffled my way through intermittent neighborhoods, often wondering what any specific inhabitant may think of our spectacle if they emerged onto their front yard, though none did. As we approached the first crew accessible aid station at Polo Fields, the sun took the remainder of its ascent seriously, resulting in a spectacular rainbow of hues across the treetops. Unfortunately, my first pair of shoes were already brewing hot spots on my arches, so I heeded the warning of more experienced ultrarunners by swapping them out with my crew before a little problem became a bigger problem. New shoes afoot and armor restocked, I departed onto the race’s first section of trail, quickly meeting my first companion of the event. To be honest, I have always struggled to taste the “new-friends-come-easy” zest that everyone seems to say is included in an ultrarunning smoothie. As someone with frequently crippling social anxiety, I often find myself seeking isolation in life and on the trail, regularly stepping to the side or telling others to pass so I do not have to grapple with the sentiment that I am burdening them with my presence or conversation. However, enter first friend. After introductions and initial small talk about the weather (which was essentially perfect by the way), I discovered that I was running with a well-known local race director, someone I consider little short of a genuine running celebrity. Despite the differences in our day-to-day lives given our 20 year age gap and me being somewhat star struck, the conversation flowed easily and the miles ticked away. After I almost lost him at an aid station, he managed to find me again and asked permission to continue running with me for a while longer. “So I can’t be bothering him too much,” I thought. My social anxiety melted away and we floated through the following couple hours until the next crew access aid station around mile 30, Meadows, where we ultimately parted ways. However, I utilized my newfound confidence to run with other participants throughout the event, including one I saved from accidentally missing a turn and another who was actively realizing that their “A” goal may be out of reach. In regards to goals, I definitely had my own. I carefully answered others’ inquiries with, “Well I’d love to just finish before the cutoff of 30 hours!,” while secretly knowing that sub-24 hours was more prominently on my radar. 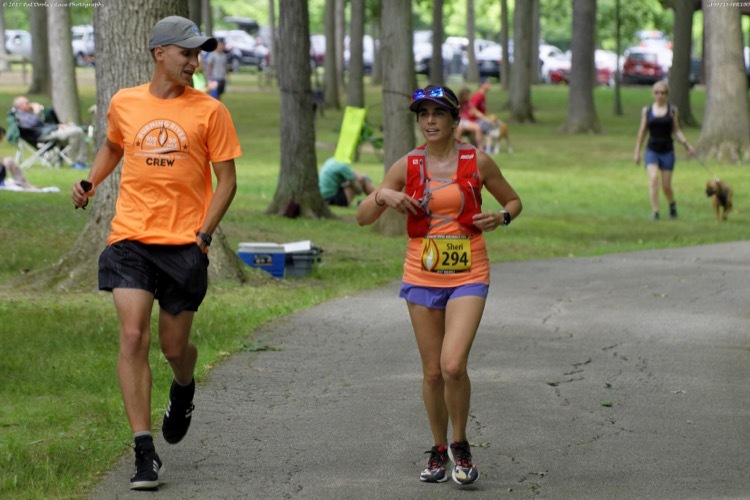 As someone who has only completed one 50-mile race (a few years prior as part of the KEYS100 event), I was naively in over my head for this level of aspiration. However, I rolled over the front 50-mile finish line of Burning River at just under ten hours, making it a 20-minute PR to the only 50-mile finish to my name. The prospect of completing 100 miles in one day then became much more feasible. I picked up my first pacer and embarked into new territory. I had 20 more miles before the dream of sub-24 came crashing down. While my body was definitely achy by this point in the race, nothing truly hurt, so I trekked along. Over this next section, I ran when it was feasible and walked when that seemed wiser, as I knew I needed to keep pushing forward with a purpose to have a chance at my “A” goal, occasionally tasting the bitterness of doubt when I would re-crunch the numbers needed to get to the finish line in that timeframe. The crushing turn of events occurred when I swapped out pacers at the Pine Hollow 1 aid station around mile 73. I tried a patch of reasonably runnable downhill single track when my right knee screamed “Stop!” I thought maybe I had caught it funny, or maybe I had stepped sideways awkwardly. Let’s just try again with another light run. “I said no!,” my right knee exclaimed, and I knew it was over. While the pain had likely arrived more insidiously than I had realized, it felt so sudden. There were 30 miles left and I could not jog a step. 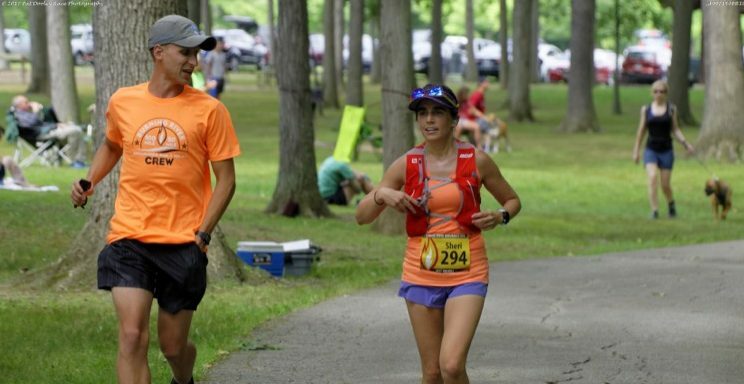 The hopeful glow of a sub-24 hours finish quickly transformed into the fear of a DNF. I had planned for soreness, I had expected fatigue, and I had even accepted the opportunity to puke, despite truly despising the sensation. But I did not anticipate a race-limiting injury. So we walked into the night. Sometimes briskly across crushed limestone or gravel paths, but often crawling at a snail’s pace down the steeper, more rooty trails. I was gifted a small bit of hope in the form of genuine smiles and a cup of coffee at the Covered Bridge aid station, with its disco ball in full glow and a 70s movie projected onto a tunnel wall. However, as the night continued to descend upon us, 65 degrees suddenly felt like the Arctic as my underdressed soul slipped off a rock and took a two-foot plunge into a cold river crossing. Each person passing me was a little stab to my self-esteem buffered by the kindness of their selflessly encouraging words. Despite having rarely chafed in the past, I suddenly needed to pee multiple times in the woods, which forced me to realize that every clothing seam had become a sharp razor to my skin. But I painfully continued forward, taking over six hours to overcome one of the hardest 16 miles of my life. The light at the end of the tunnel was finally visible when we arrived around mile 93 at the Botzum Parking aid station. My crew quickly sat me in a camp chair and covered my chill skin in jackets and blankets as I stuffed my face with the most decadent salt and vinegar chips in existence. After a few minutes of rest and reset, I stiffly arose and disappeared back into the darkness to slowly climb unusual staircases in the forest and watch the night evaporate into a new sunrise. I crossed the finish line of my first 100 mile race in 26 hours, 16 minutes, and 38 seconds. I gratefully accepted the most beautiful belt buckle I have ever seen and was helped back into my camp chair. I wanted to cry, but did not have the energy nor hydration for tears. Laying my head on my knees and welcoming the bizarre combination of accomplishment, disbelief, and exhaustion, I fell asleep. When I awoke an hour later, it all seemed like a dream until I tried to make it to a porta-potty 50 feet away; then the reality of what had just happened truly settled in. We cheered a few other runners across the finish line, relishing in a sense of awe for every single person, and eventually made our way back to regular life. My armor has since been cleaned and stored away as I sit here a week later with not a single new mile under my legs, typing this mildly disjointed collection of what are now memories. Despite the pain, I know it will not be long before I suit up again. The craving for battle has already begun creeping into my internet browsing history, which now contains numerous new links to 100-mile race websites. 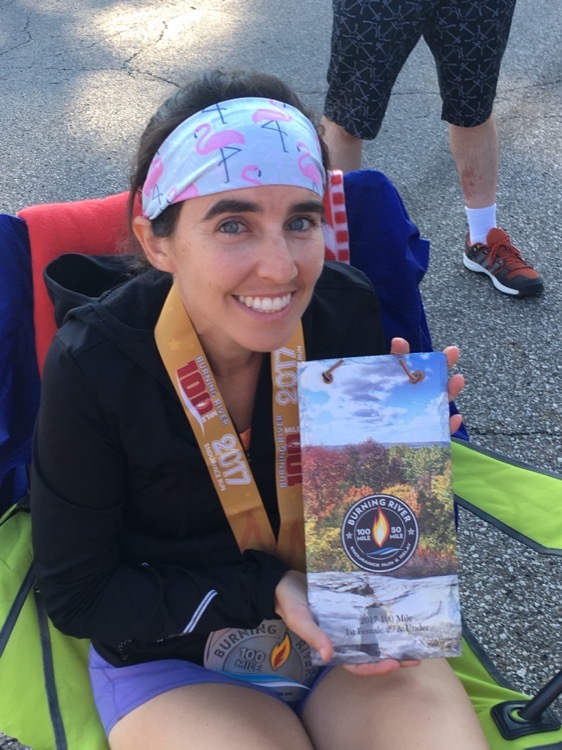 I would love to return to Burning River again for round two as the trails were wonderful and perfectly marked, the race organization was incredible, and the volunteers were extremely hard to beat. Though I also wonder if I have a limited number of 100-mile runs in my legs and should therefore go on a new exploration. Regardless of what I eventually decide, I know that this experience has allowed me to chip away at a deeply ingrained, stonewall anxiety towards a newfound confidence that will only make me stronger in running and in life. Because now I know that while I may be but little, I am fierce. Congrats on your finish at Burning River! I was captain at Covered Bridge and you looked strong, we never doubted for a moment. Wear that buckle with pride, you’ve earned it. Great post race reflection. Thanking you for sharing your story! 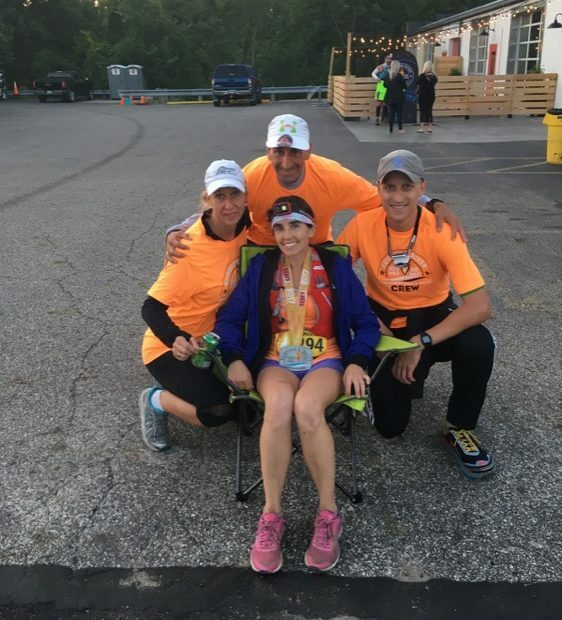 Congratulations on a great BR100 and fun race report. You looked great when I took your photo at Meadows. Loved your story as this was my first Burning River too and I can relate to much of what you were feeling!! And I’m certain, I would have welcomed your company!! What a wonderful story, and a wonderful ending! Congratulations! You have accomplished something truly magnificent! I completed the BR100 last year, but despite cool temps DNF-ed this go around. It’s all part of an excellent journey pushing our boundaries and doing what even we can not comprehend. Congratulations! And not just finishing, but placing first in your AG! How awesome is that! Great read, we’ll done indeed! Great race report. Burning River was my first 50 miler and I shared a bit of your anxiety and doubt about accomplishing my “first”. Your story brought back fun memories. Best of luck on future races.